When I was a teenager I’d write and write and write. Mostly poetry, angst ridden, laden with oh so unsubtle hints about the misery I felt and the trauma, yes the trauma, of teenage life. I kept diaries, pages and pages of text about whatever drama was unfolding at this, most crucial, moment of my life. As an adult I’ve often thought that the most artistic people out there are tortured souls, leading lives that seep into their art, giving it depth and strength. Perhaps this is me falling for the ‘romantic’ Pre-Raphaelite view of the struggling artist. 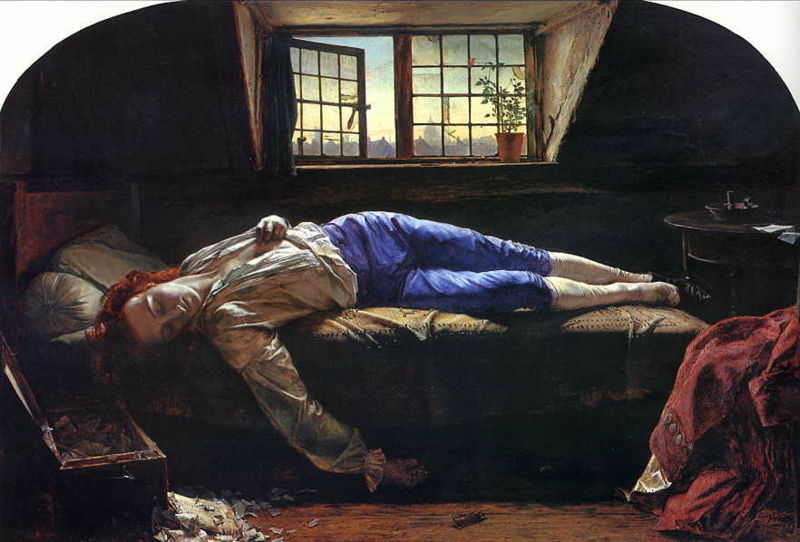 I can never quite get Henry Wallis’s painting of The Death of Chatterton (1856) out of my head when thinking about the ‘artist’. Perhaps it’s a tendency to melancholia but the songs, movies and stories that touch me most deeply are the sad ones, the soul wrenching ones, the ones that make me cry or question the world around me. So why do I struggle so much to write when I’m going through emotional times? Why can I not use that pain and heartache, channel it into something constructive, something beautiful. Why can’t I take that energy, all be it negative, and turn it into fantastic poetry or a great story? Instead it just tends to make me tired and unable to focus well. Why, when I was a teenager was angst my muse, and now it’s my writer’s block?